Tree uses data from Peppers et al (2002) and Carroll and Bradley (2005) with large uncertain region shown as a polytomy. 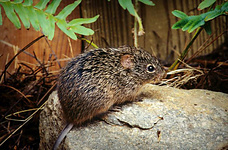 The rodents of Sigmodontini are commonly referred to as the cotton rats; a name that stems from their habit of using cotton fibers to make nests. The tribe is comprised of a single genus, Sigmodon, which consists of twelve recognized species and many subspecies. The Sigmodontini are found throughout both North and South America with a majority residing in Central America and only a few species living in the United States or South America. Sigmodon hispidus, a Sigmodon species commonly occurring in the United States. Sigmodon are generally large sized rodents which average greater than 100 grams. They generally have a dark colored coat with large eyes and small ears. The tail is usually sparsely covered by hair and shorter than the body length (Voss, 1992). Sigmodon fulviventer is the largest of the Sigmodontini and reaches a mass of 220 grams (LaRoche and Yahnke, 2004). There is little morphological difference among the species of the Sigmodontini. The Sigmodontini range from northern South America to central United States. Sigmodon hispidus has been expanding its range across the United States at a rapid rate. It is now commonly found north of Tennessee and has been seen occasionally in Illinois. They tend to prefer grassy fields and will build nests and runways in the dense ground foliage. The US species of Sigmodontini are mostly nocturnal in their behavior and are active throughout the year (Stafford, 2000). While they are capable of breeding throughout the year, most reproduction happens in the late summer with litter sizes ranging from two to fifteen (Voss, 1992). Sigmodon hispidus is the type species (Say and Ord, 1825). A large volume of work has been conducted using the North American species; however, little phylogenetic work has utilized the South American species. Voss (1992) provides a great deal of systematic work based on morphology. Early morphological descriptions of the Sigmodontini was provided by Say and Ord (1825); however, these descriptions are based on only three samples of Sigmodon hispidus collected in Florida. 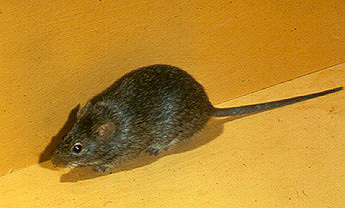 The Sigmodontini have small ears, short whiskers, and short tails. They have unwebbed hind feet with the first and fifth digits shorter than the middle three. Their molars are hypsodont with conspicuous lophodont (high crowned with ridges perpendicular to the jaw). These molars are best suited for grinding the stems, roots, and shots that compose the bulk of their diet. The cusps and crests are arranged in a sigmoidal array (S-shaped), and the mesoloph is absent (Say and Ord, 1825). Morphological differences among the Sigmodontini are rather scarce. Sigmodon alstoni is perhaps the most divergent of the group and most easily identified. It is distinguishibale due to its smaller size, deeply grooved incisors, rounded cusps on upper molars, and mandibular molars with only three roots (Voss 1992). Morphological characters among other species of Sigmodon vary only slightly. Historically, Sigmodon has been associated at times with other hypsodont and lophodont groups. For example, Herskovitz (1955) recognized the sigmodont group to include the marsh rat Holochilus (later removed to Oryzomyini by Voss and Carleton (1993) and Steppan (1995)), Reithrodon, and Neotomys (both placed in Phyllotini by Olds and Anderson (1989) and Steppan (1995)); but Reithrodon was removed to an independent lineage or Reithrodontini by Smith and Patton (1999), Jansa and Weksler (2004), and Steppan et al. (2004). Little work has been done to determine the phylogenetic relationships among the species of Sigmodon. Oftentimes, Sigmodon hispidus and Sigmodon alstoni appear in larger sample sets; however, only one major study has been conducted with focus on the Sigmodontini. Peppers et al. (2002) utilized cytochrome b sequences, and the follow-up study (Carroll and Bradley, 2005) added sequences from nuclear intron 7 of beta-fibrinogen. Both studies used fifteen Sigmodon subspecies representing ten different species. The majority of the taxa used in the study were collected from the southern US and Mexico, except for the South American Sigmodon alstoni. Placement of Sigmodon alstoni as the most basal member of the Sigmodontini is in agreement with other studies (Steppan, unpublished). Furthermore, the grouping of S. alleni and S. hirsutus was well supported as well as the grouping of S leucotis and S. fulviventer. Strong support for grouping S. mascotensis, S. hispidus, and S. arizonae was found, but the relationship among them was largely unresolved. However, the branching pattern was not robustly resolved and additional genes and more detailed taxon sampling is needed (Carroll and Bradley, 2005). Carroll, D. S. and R. D.Bradley. 2005. Systematics of the Genus Sigmodon: DNA Sequences from Beta-Fibrinogen and Cytochromeb. The Southwestern Naturalist 50(3): 342-349. Hershkovitz, P. 1995. South American marsh rats, genus Holochilus, with a summary of sigmodont rodents. Fieldiana: Zool. 37:639-673. LaRoche, J. and C. Yahnke. 2004. "Sigmodon fulviventer" (On-line), Animal Diversity Web. Accessed April 04, 2006 at http://animaldiversity.ummz.umich.edu/site/accounts/information/Sigmodon_fulviventer.html. Peppers, L. L, D. S. Bradley, and R. D. Bradley. 2002. Molecular Systematics of the Gnus Sigmodon (Rodentia: Muridae): Evidence from the Mitochondrial Cytochrome-b Gene. Journal of Mammalogy 83(2): 493-407. Say, T. and G. Ord. 1825. Description of a new species of Mammalia, whereon a new genus is proposed to be founded. J. Acad. Nat. Sci. Philaddelphia 4:352-355. Stafford, B. 2000. "Sigmodon hispidus" (On-line), Animal Diversity Web. Accessed April 04, 2006 at http://animaldiversity.ummz.umich.edu/site/accounts/information/Sigmodon_hispidus.html. Strauss, J. H. and E. G. Strauss. 2002. Viruses and Human Disease. New York: Academic Press. Voss, R. S. 1992. A revision of the South American species of Sigmodon (Mammalia: Muridae) with notes on their natural history and biogeography. American Museum Noviates 3050:1-56.